Join EJ, Izzi, and the Auto City gang for three new adventures: Monster Trap - about trusting friends; CARnival - about being helpful; Lug Nutt - about being successful. You'll learn important life-lessons, and have lots of fun on the way! 40 minutes. Ages 3-7. 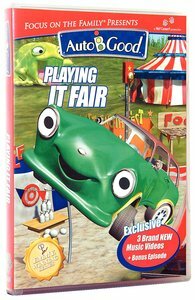 About "Playing It Fair (#05 in Auto B Good Dvd Season 2 Series)"
Customer Reviews For "Playing It Fair (#05 in Auto B Good Dvd Season 2 Series)"
This has been a hit for the kids. They watch it over and over (and the adults too). It is fun, nice car jokes and good lessons including having a good work ethic. Highly recommended.